The weather here in Arizona has been strangely warm and last year's tomato plants are still alive and well. I thought about ripping them out in November because they looked sad but I left them. Then I made a tent with 2 cattle panels and a barbeque cover. It worked well and the tomatoes thrived. They grew so much that they started poking out from under the cover. I decided to give them more room so I put 2 wood spacers in between the panels. 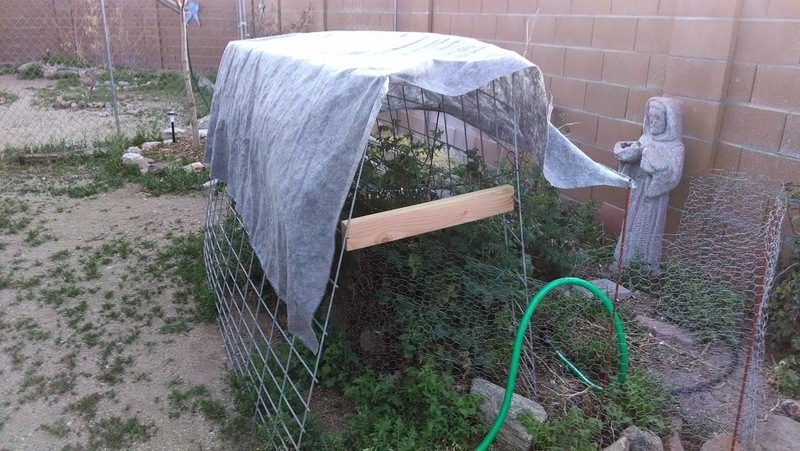 This works great for frost protection (if it ever gets cold again) and sun protection since the days have been creeping toward the 90's and the leaves were drooping. The one thing it is not good for it wind protection. It was slightly breezy today and one of the spacers fell down. I need to drill holes in the ends so that I can connect them to the panels. I have been taking the cherry tomatoes off green and letting them turn red inside the house but now they are turning red on the plant. Oh, and the best part of having tomato plants in February, besides the tomatoes, is that there are no bugs! Haha, that's St. Franken-Francis. He came with the house. Quite a homely fellow. I think he scares away the birds.